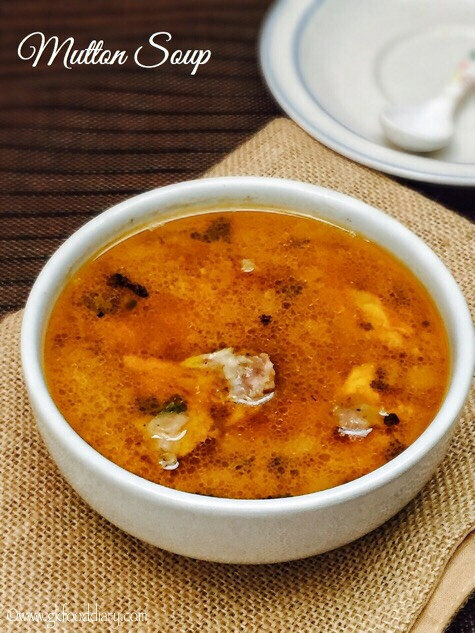 Mutton Soup - Easy and healthy soup for babies toddlers and kids with mutton/lamb. Keep all ingredients ready. Clean mutton pieces and chop into small pieces. Finely chop ginger, coriander leaves, onions & garlic. In a pressure cooker, heat a tsp of ghee/oil and add cinnamon, cloves & cumin seeds and fennel seeds. Let cumin seeds crackle. Then add onions & garlic. Fry them nicely until golden brown. Now add chopped mutton pieces and give a quick stir. Then add red chilli powder, pepper powder and required salt. Mix everything well and then add coriander leaves. Pressure cook the mutton with 2.5 cups of water 5-8 whistles in medium flame.or until the mutton is cooked well. Once the pressure is released open the cooker. Strain the mutton soup with a strainer to get a clear soup.